Though the Chargers fell to the Rams 35-23, one bright spot in the loss was the play of Mike Williams. Williams had a stellar training camp, but those who sang his praises on the practice field were hoping he’d deliver under the lights on Sundays. Since the start of the season, he has. 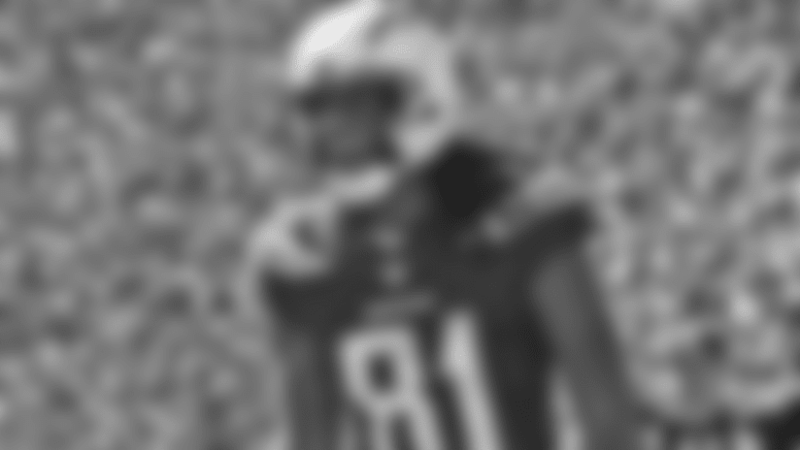 Sunday was a career day for number 81 as he had single-game career highs in receiving yards (81) and touchdown catches (two). His TDs were clutch with the first getting the Bolts on the board and the second, occurring on fourth down. After a rookie season he’d like to forget, Williams entered 2018 wanting to prove doubters wrong. His play speaks for itself. Through three games, Williams has 11 receptions for 189 yards and leads the wide receiving corps with three scores. So what’s the biggest difference for Williams? According to his head coach, it’s his health and comfort in the system. With Week 4 on the horizon, Williams and the team are looking forward to further production from the wideout. 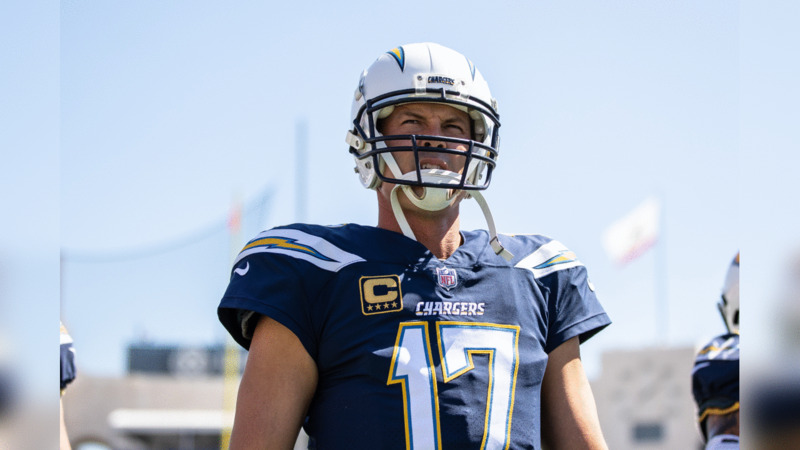 For a guy like Philip Rivers, he isn’t surprised Williams has had the success he’s had so far this season and he knows he’s going to continue being a key cog in the offense moving forward. Philip Rivers looks on during the Bolts' Week 3 matchup against the Rams at the LA Memorial Coliseum. Russell Okung pumps up the team before the Bolts' Week 3 matchup against the Rams at the LA Memorial Coliseum. Jahleel Addae gets hyped before the Bolts' Week 3 matchup against the Rams at the LA Memorial Coliseum. Trevor Williams walks through the LA Memorial Coliseum tunnel before the Bolts' Week 3 matchup against the Rams. Coach Stewart speaks to the team hyped before the Bolts' Week 3 matchup against the Rams at the LA Memorial Coliseum. Mike Pouncey looks on ahead of the Bolts' Week 3 matchup against the Rams at the LA Memorial Coliseum. Antonio Gates speaks with Todd Gurley before the Bolts' Week 3 matchup against the Rams at the LA Memorial Coliseum. Derwin James lines up during the Bolts' Week 3 matchup against the Rams at the LA Memorial Coliseum. Brandon Mebane forces a fumble on Todd Gurley during the Bolts' Week 3 matchup against the Rams at the LA Memorial Coliseum. Desmond King and Jahleel Addae celebrate a forced fumble during the Bolts' Week 3 matchup against the Rams at the LA Memorial Coliseum. Uchenna Nwosu makes a tackle during the Bolts' Week 3 matchup against the Rams at the LA Memorial Coliseum. Isaac Rochell makes a tackle during the Bolts' Week 3 matchup against the Rams at the LA Memorial Coliseum. Brandon Mebane sacks Rams QB Jared Goff during the Bolts' Week 3 matchup against the Rams at the LA Memorial Coliseum. Mike Pouncey blocks for Philip Rivers during the Bolts' Week 3 matchup against the Rams at the LA Memorial Coliseum. Philip Rivers makes a pass during the Bolts' Week 3 matchup against the Rams at the LA Memorial Coliseum. Melvin Gordon hurdles over a Rams defender during the Bolts' Week 3 matchup against the Rams at the LA Memorial Coliseum. Melvin Gordon runs downfield during the Bolts' Week 3 matchup against the Rams at the LA Memorial Coliseum. Mike Williams scores his first touchdown of the day during the Bolts' Week 3 matchup against the Rams at the LA Memorial Coliseum. Mike Williams dives to score a touchdown during the Bolts' Week 3 matchup against the Rams at the LA Memorial Coliseum. Brandon Mebane and Melvin Ingram high-five after Mebane sacked Jared Goff during the Bolts' Week 3 matchup against the Rams at the LA Memorial Coliseum. Brandon Mebane forces a fumble during the Bolts' Week 3 matchup against the Rams at the LA Memorial Coliseum. Derwin James reaches up for an interception during the Bolts' Week 3 matchup against the Rams at the LA Memorial Coliseum. Derwin James celebrates his first NFL interception during the Bolts' Week 3 matchup against the Rams at the LA Memorial Coliseum. The Bolts pose to celebrate Derwin James' first NFL interception during the Bolts' Week 3 matchup against the Rams at the LA Memorial Coliseum. Antonio Gates runs downfield after catching a pass from Philip Rivers during the Bolts' Week 3 matchup against the Rams at the LA Memorial Coliseum. Austin Ekeler runs downfield during the Bolts' Week 3 matchup against the Rams at the LA Memorial Coliseum. Keenan Allen leaps up to grab a pass from Philip Rivers during the Bolts' Week 3 matchup against the Rams at the LA Memorial Coliseum. Keenan Allen waves to the crowd during the Bolts' Week 3 matchup against the Rams at the LA Memorial Coliseum. Melvin Gordon dives into the end zone to score a touchdown during the Bolts' Week 3 matchup against the Rams at the LA Memorial Coliseum. Derek Watt, Melvin Gordon and Virgil Green celebrate Gordon's touchdown during the Bolts' Week 3 matchup against the Rams at the LA Memorial Coliseum. The team celebrates Melvin Gordon's touchdown during the Bolts' Week 3 matchup against the Rams at the LA Memorial Coliseum. Philip Rivers talks with Melvin Gordon on the sideline during the Bolts' Week 3 matchup against the Rams at the LA Memorial Coliseum. Jahleel Addae tackles during the Bolts' Week 3 matchup against the Rams at the LA Memorial Coliseum. Tyrell Williams looks to avoid Aqib Talib during the Bolts' Week 3 matchup against the Rams at the LA Memorial Coliseum. The Bolts huddle before a play during the Bolts' Week 3 matchup against the Rams at the LA Memorial Coliseum. Mike Williams dives into the endzone for his second touchdown of the day during the Bolts' Week 3 matchup against the Rams at the LA Memorial Coliseum. Mike Pouncey and Keenan Allen congratulate Mike Williams on his second touchdown of the day during the Bolts' Week 3 matchup against the Rams at the LA Memorial Coliseum. Mike Williams celebrates his second touchdown of the day during the Bolts' Week 3 matchup against the Rams at the LA Memorial Coliseum. Mike Williams smiles after his second touchdown of the day during the Bolts' Week 3 matchup against the Rams at the LA Memorial Coliseum. Austin Ekeler avoids defenders while running downfield during the Bolts' Week 3 matchup against the Rams at the LA Memorial Coliseum. Mike Williams catches a pass from Philip Rivers during the Bolts' Week 3 matchup against the Rams at the LA Memorial Coliseum. Philip Rivers and Antonio Gates slap hands during the Bolts' Week 3 matchup against the Rams at the LA Memorial Coliseum. Melvin Ingram tackles Todd Gurley during the Bolts' Week 3 matchup against the Rams at the LA Memorial Coliseum. Melvin Ingram brings down Todd Gurley during the Bolts' Week 3 matchup against the Rams at the LA Memorial Coliseum. Melvin Ingram celebrates his tackle of Todd Gurley during the Bolts' Week 3 matchup against the Rams at the LA Memorial Coliseum.